Interested in examining networks from social media? 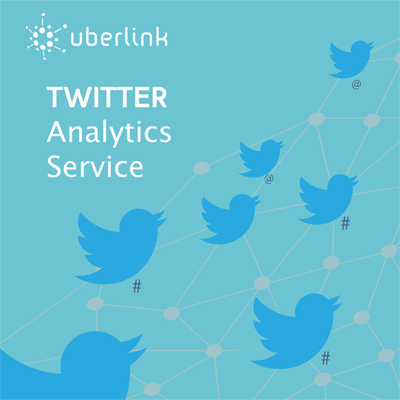 With the Twitter Analytics Service Uberlink provides the ability to access Twitter data to create a variety of social networks (complete with statistics) based upon connections between Twitter users. This rich source of data allows us to provide you with social networks formed from a search query over Twitter's curated list of matching Tweets. The Service also includes a Situation Report (SitRep), providing hands-on analytics for the network you created. Our Twitter Analytics Service can help! Provide us with your list of hashtags, usernames etc. that you'd like us to 'listen' for. If you need to adjust your query, you can do so twice in the first month. We provide you with a quote for that query, maximum monthly volume and duration. We provide social networks from users whose activity matches the query you provide. We provide three social networks: mention, reply and retweet. We also provide Social Network Analysis at both the network and the individual node level. Networks can be delivered in GraphML, a standard network analytics file format. The JSON format is also available. Need another format? Uberlink offers conversion filters on our GitHub page.